Thinking about picking up one of those updated PlayStation VR headsets this holiday season? You might as well get Gran Turismo Sport for free, too. 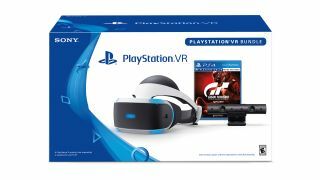 Sony just announced a new PSVR bundle that includes a PSVR headset, a PS4 camera (required to use PSVR), and a copy of Gran Turismo Sport for the standard PSVR bundle price of $399.99. Just add a PS4 or PS4 Pro and you're off to the virtual races. This bundle hasn't been announced for release outside of North America at the moment. Gran Turismo Sport has a few VR-specific features, including VR Drive within Arcade Mode, which lets you race a single opponent using select cars. As you'd expect from Gran Turismo, you can also just gape at exquisitely rendered interiors and exteriors if you're not in the mood for racing. GT Sport is by no means a full-fledged VR game, but those bonus features should be pleasing for automobile enjoyers nonetheless. If you get tired of first-person car ogling, the bundle also includes a new version of the PSVR demo disc with 13 included "experiences". Sony doesn't specifically say what those 13 items are, but a pretty decent selection of PSVR games has come out since the first demo disc arrived; it would be nice if players could try out stuff like Farpoint or the post-Kitchen Resident Evil 7 VR experience. Sony says the PlayStation VR Gran Turismo Sport bundle will start hitting retailers in the next few days. Check out our Black Friday gaming deals predictions if you want to get ready to find even more savings. GR+ may receive a portion of the sales price for purchases made using retailer links in our articles.